Tudor has two overriding stars in its illustrious history: the Submariner and the Chronograph. 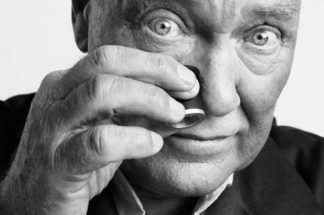 Both watches have now reached cult status among collectors of vintage pieces, achieving prices equal to, and in some cases exceeding, those of their coroneted cousins. In April this year, a very rare Tudor Submariner was offered to the market by a dealer for $350,000, and at the time of writing we are still recovering from the Phillips Geneva Watch Auction: Five, where a prototype chronograph dial (in a ref. 7032 Home Plate case) sold for a whopping CHF 93,750. The days when elitist watch snobs could claim that Tudor is “a poor man’s Rolex” are now well in the past. Vintage Tudor is playing in the big league. Going back to the early days of vintage watch collecting, Tudor chronographs have always been keenly pursued by the connoisseurs of rare pieces. Built within the iconic Oyster case, the Tudor chronographs have always been graced with an eye-catching aesthetic based on classic chrono layouts that were executed in daring colours and styling. This became a trademark of Tudor. Whereby Rolex kept its output reasonably sober (with the exception of the exotic dial “Paul Newman” Daytonas and the “Disco” Explorer 2 ref. 1655), it seems that Tudor was allowed to experiment and push the boundaries. Blue Submariners and chronographs executed in bright blues, orange and greys were the trademarks of Rolex’s cheeky younger brother. 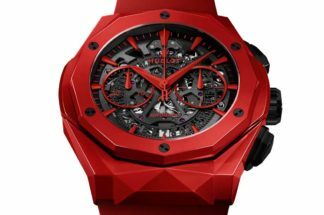 However, these watches have become highly collectable and sought-after in recent years and it seems that interest is continuing to grow year-on-year. We now know that Tudor was experimenting with designs for a chronograph in the late-1960s, as the Phillips prototype dial highlights. Tudor and Rolex’s old dial supplier Singer seemingly presented different options to Tudor for consideration and the discovered prototypes feature “TUDOR” typography that was typically seen on the Submariners from the 1960s and that weren’t used in the final version of the dial. These prototypes (there is also a white one) were two chronos with interesting accents in very bold red against the black and white main layout. However, the final production version was much bolder. 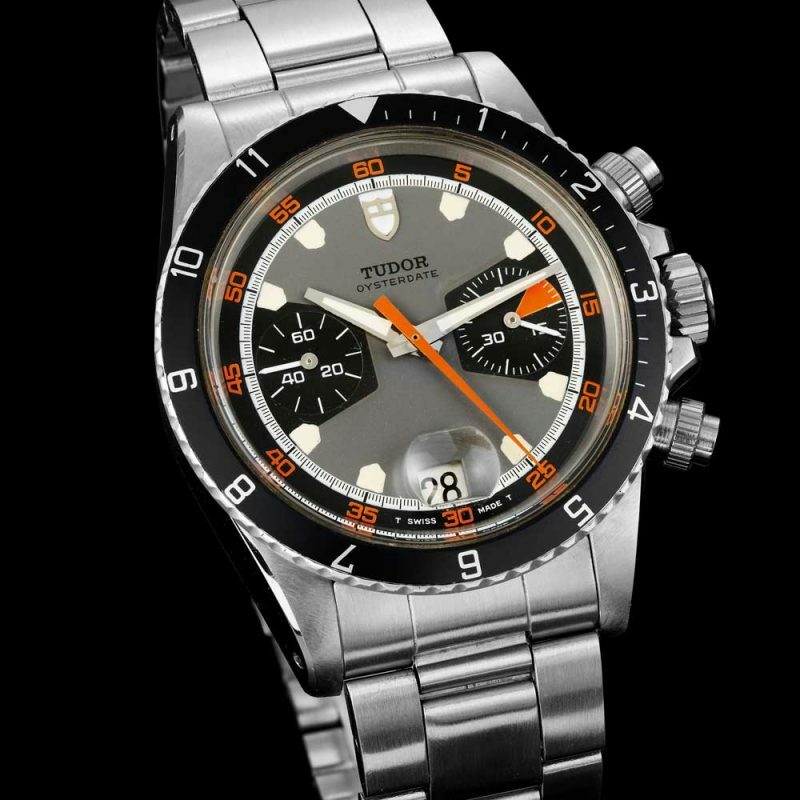 In 1970 Tudor launched the Oysterdate chronograph in two references, the 7031 and 7032. The watch was Tudor’s first chronograph and the watches were large at approximately 40mm. 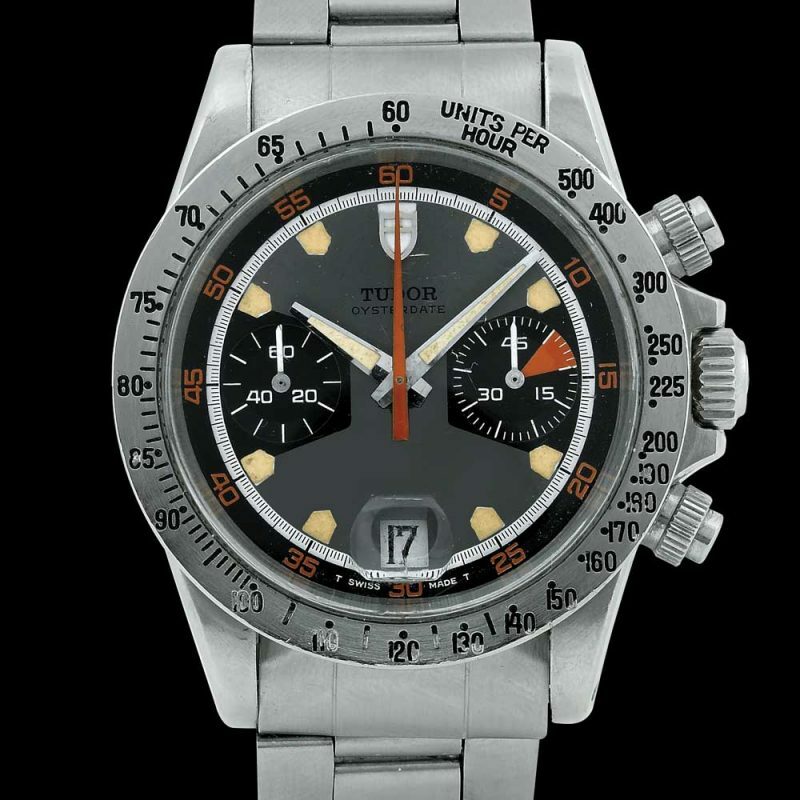 The Rolex Daytona was smaller at 36mm and so the Tudor had a more robust presence on the wrist. The case featured crown guards that were similar to the very early square guards on the first series 7928 Submariners and was fitted with waterproof screw-down pushers which prevented accidental pushing during timing exercises. The watch featured a date complication at six o’clock on the dial, which had a unique acrylic cyclops crystal like none other before it, with the magnification bubble mounted horizontally at the bottom of the glass. Refs. 7031 and 7032 were essentially identical with the only difference being the bezel. 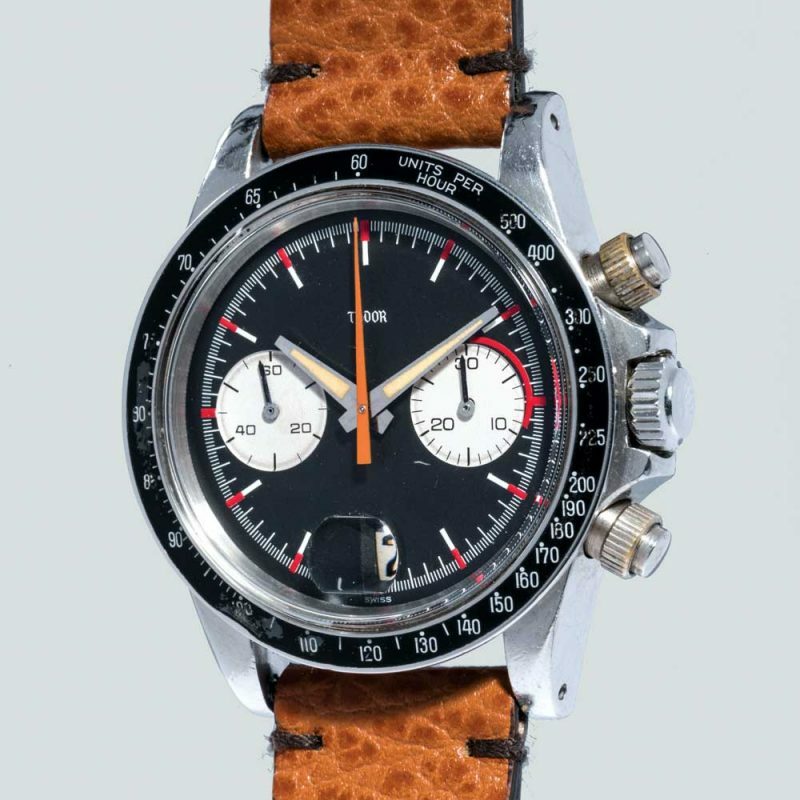 The 7031 featured a black plastic tachymeter bezel that was very similar to the bezel on the 6263 Daytona. The 7032 featured an all stainless-steel tachymeter. It isn’t unusual to see watches where the bezels were switched. I suspect that authorised dealers allowed good customers to choose which bezel they would prefer. Additionally, the plastic bezels were more easily damaged and are now very difficult to obtain. There was always the myth of a third version too, with a rotating bezel (as seen on later series chronographs). In recent years as Tudor has celebrated its past and showcased pieces from their museum archive, we have had the myth confirmed and learnt that Tudor made a prototype 7033 chronograph. This was again essentially identical to the 7031 and 7032, but featured the rotating graduated 12-hour bezel made from a black aluminium insert in a steel knurled bezel ring. Whilst this reference never made it to production, it was the inspiration for the first Tudor Heritage watch, the Heritage Chronograph in 2010. The most striking aspects of these first series chronos are the dials. 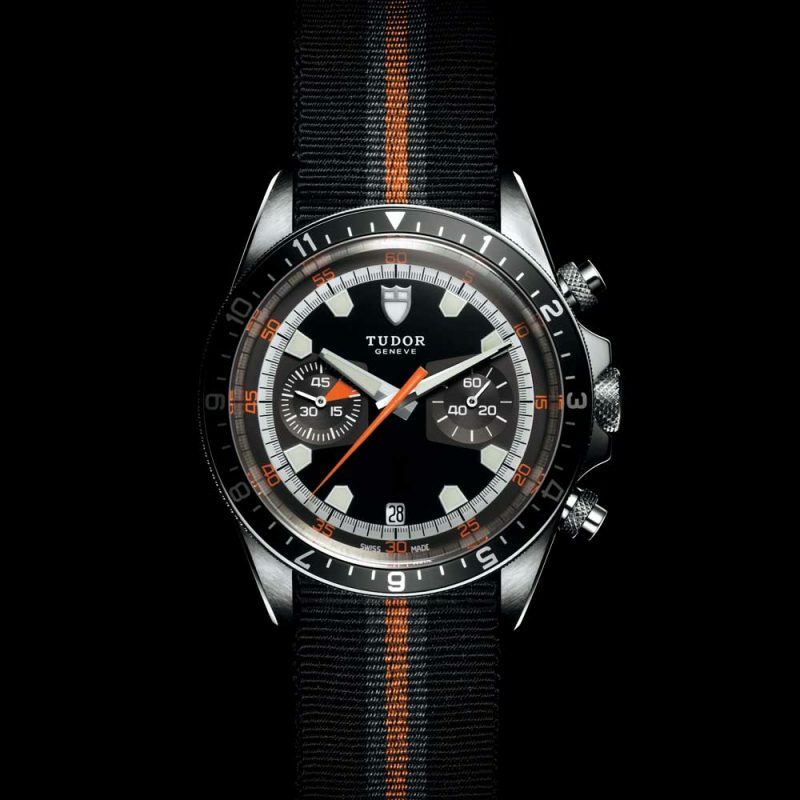 Tudor opted for a design that was both bright and unusual in its use of detail. The most notable feature of the 703x watch is the shape of the hour markers, which are like the home plate on a baseball field. This led to collectors giving the watch its well-known nickname the “Home Plate”. 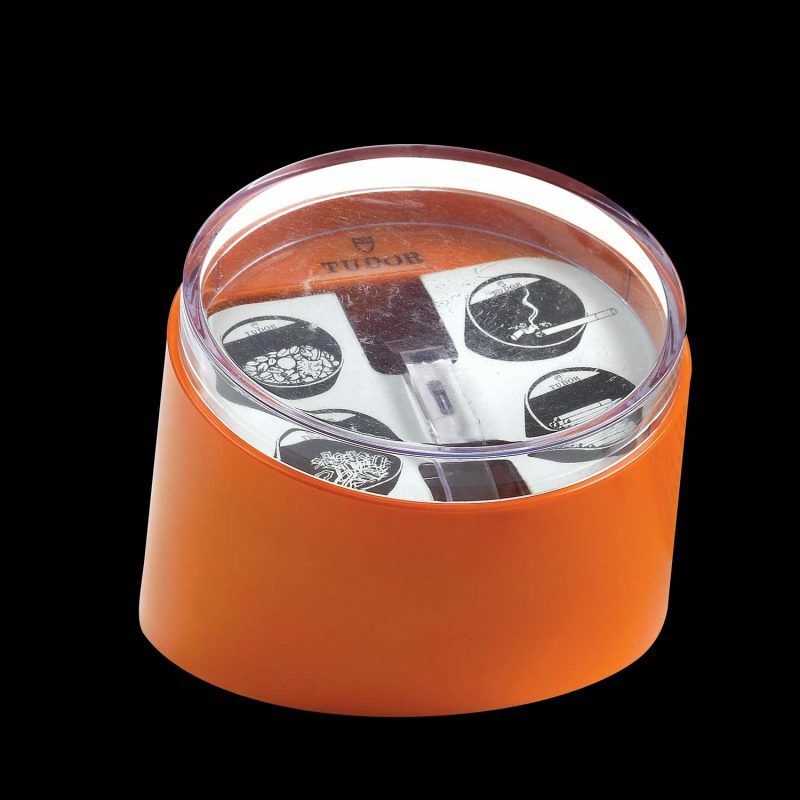 The main colour for the dial was grey, with a black outer track that had five-second numerals in bright orange. The running seconds counter and 45-minute counter were black, with the latter having a bright orange triangle in the 5-10 minute portion. The stopwatch centre-seconds hand is also bright orange. There was also a black-dialled version, which is exceedingly rare. I would estimate that there are less than a dozen examples of these and it is a commonly held belief that these black dials were service replacements. It is quite common to see “spotting” on the grey areas of the Home Plate dials and I expect that Tudor provided the more robust black versions to service centres in the same way they did with blue snowflake Submariner dials when the black ones rotted. I know of only a couple that have come from original owners, who were adamant that they were bought in this configuration. Again, maybe authorised dealers offered the black as an option to preferred clients. Either way, they are the Holy Grail for Tudor collectors. Over the years another name has periodically been used for the Home Plate. The wrist-mounted chronograph was the perfect solution for the car racing industry and so it seems fitting that the other nickname for the 703X watches was the Porsche Chrono. This name exists due to an advertisement for the Japanese market, where a 7032 advert featured a Porsche 911 – two icons side by side. It is a tenuous link but one that seemed to stick. The last thing that is worth noting about these watches is the box in which some of the Home Plates were delivered. Like nothing seen before or since, an orange cylindrical two-piece outer card box held an inner bright orange display box. As per Rolex boxes of the time it encouraged owners to reuse the box as a receptacle for peanuts, cigarettes, paperclips or as an ashtray. Due to this, collectors have dubbed the box the “Peanut Box” and it has become highly sought after in its own right, commanding a few hundred pounds when (very occasionally) sold on auction sites. In 1971, Tudor unveiled the second series of chronographs. Having had reasonable success with the Home Plate watches, the decision was set to continue with the flamboyant use of colour that was becoming something of a trademark for Tudor. 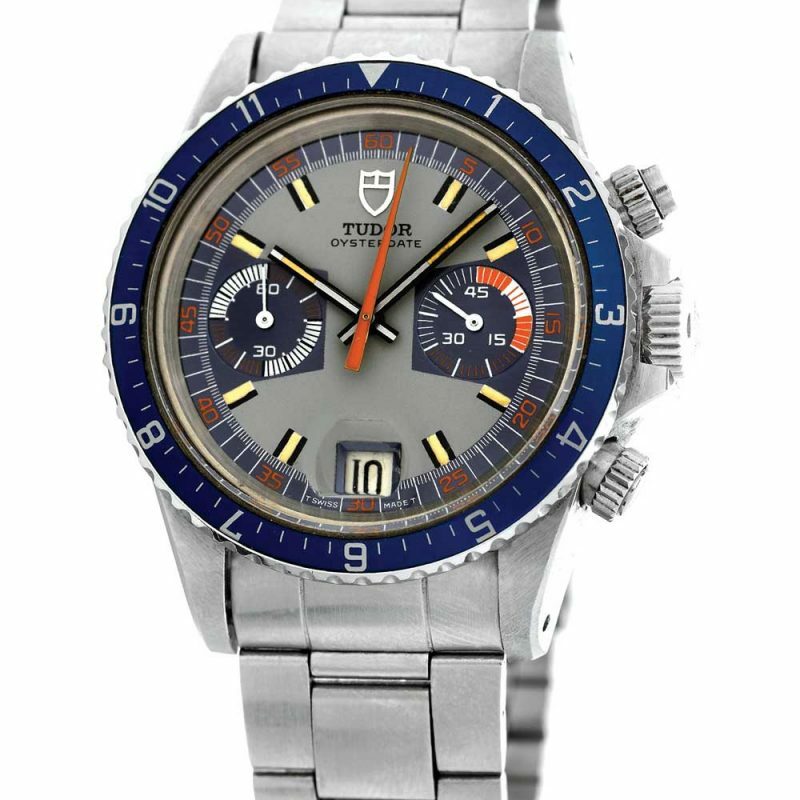 Having attended the Tudor events at Baselworld for four years (since the inception of the now legendary Tudor Basel Launch Party), I can imagine the interest that there would have been in Basel in 1971 when these watches were unveiled. We have now become accustomed to Tudor pushing the boundaries and accepted conventions within the Wilsdorf group with the pièce unique for Only Watch and the general focus on the Heritage pieces. At the time, these Series Two chronographs were big, bold and daring and, I would like to think, would have raised a few eyebrows. 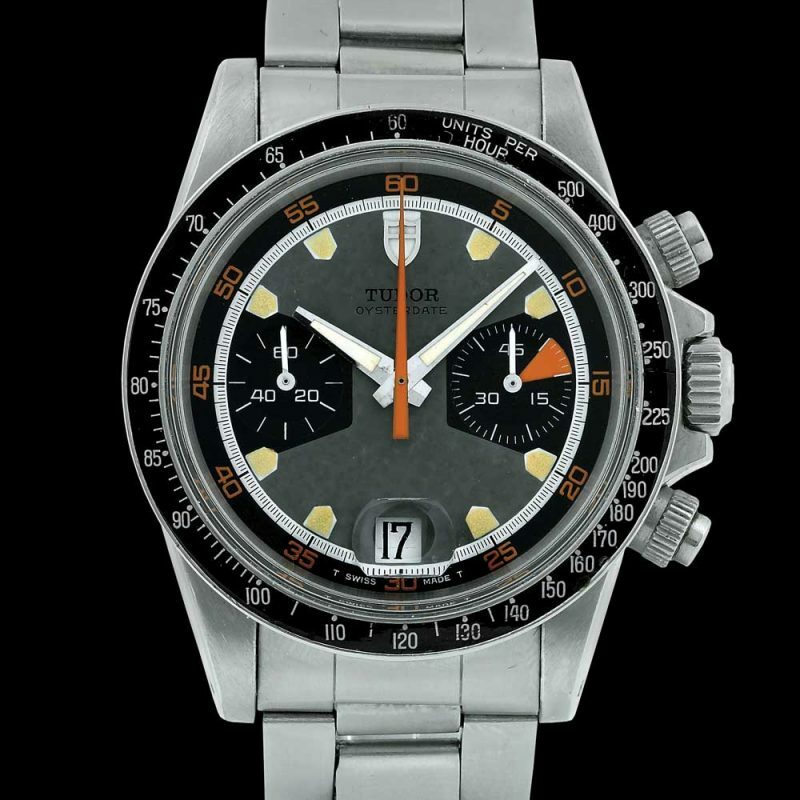 Tudor used the third bezel type in the second series to increase the options for the market. Having experimented with the 12-hour bi-directional rotating bezel on the prototype 7033, it was now in production. 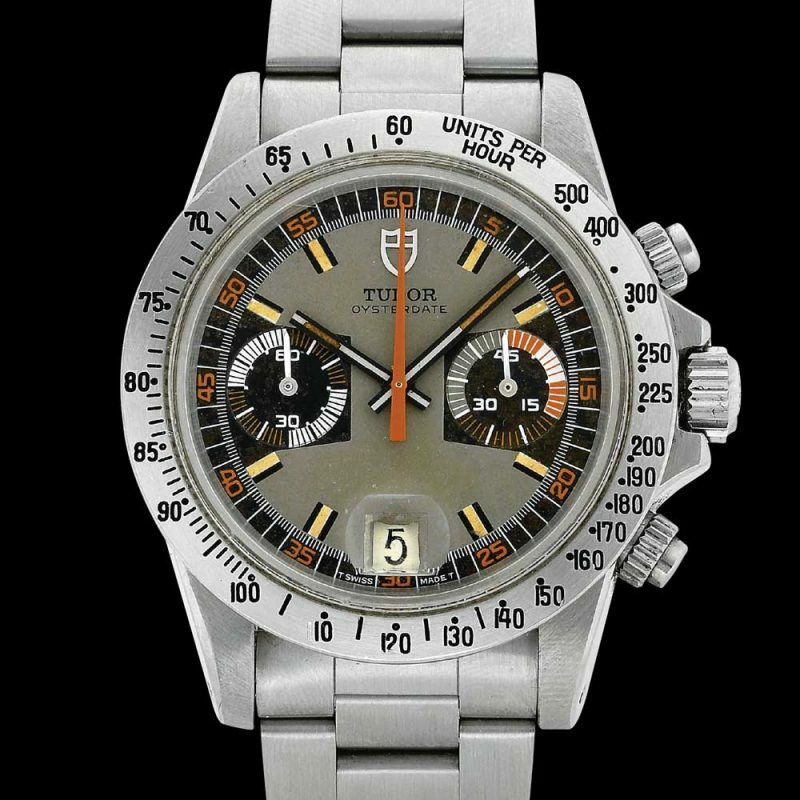 This was a function unique to Tudor chronographs, unlike the acrylic and steel tachymeters that could also be seen on Rolex watches. The line-up comprised three watches – the 7149 (acrylic tachymeter bezel), 7159 (steel tachymeter bezel) and the 7169 (12-hour graduated bezel). There were some common features with the first series Home Plate watches, such as the long triangular orange stopwatch second hand, two-register dial layout and date window (with accompanying unique date bubble) at 6 o’clock. The Home Plate’s colour scheme of grey/orange/black was also supplemented by a grey/orange/blue colourway. 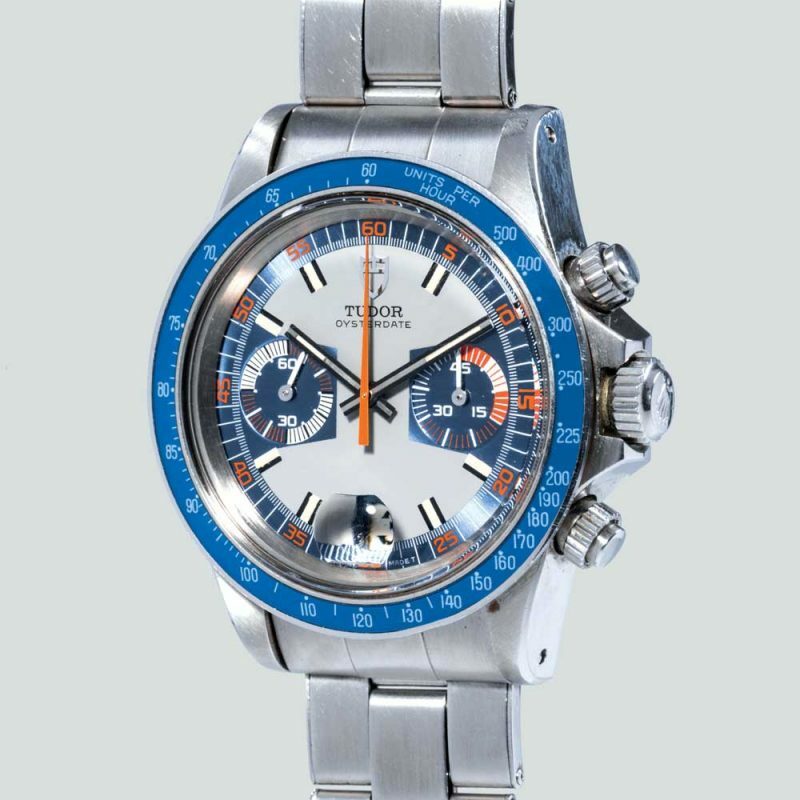 The introduction of the blue element on some watches necessitated a blue acrylic tachymeter bezel instead of black on the 7149s and a blue 12-hour bezel insert on the 7169. As with the first series watches, the 71X9 watches featured painted hour markers instead of applied metal markers. In my opinion, this gives the watches a sportier aesthetic reminiscent of vintage Submariners. The home plate markers were replaced with a more conventional rectangle of lume flanked by two black lines. The use of bright colour though was even more pronounced, with bright orange elements on both chronograph registers as well as on the outer seconds markers. It was this second series that became known by collectors as the original Monte Carlo watches, as the dials resembled roulette tables. Very often the Home Plate watches are also referred to as Monte Carlos, but this isn’t technically correct and the nickname should only really be used when referring to the 71X9 series watches. The watch cases remained largely unchanged across both series of two-register chronos. The second series remained in the Tudor catalogue until approximately 1977. During the course of its run the screw-down crowns were upgraded to the improved trip-lock crown (ref. 702) and the profile of the knurling on the pushers became more pronounced. The biggest non-visual change was the movement. The Home Plates were equipped with the Valjoux calibre 7734, which had been a good workhorse for the watches. The 7100 series housed the Valjoux calibre 234 – a high-frequency movement with improved accuracy and upgrades to the column wheel and clutch. The earlier watches in this series were delivered on folded-link Oyster bracelets ref. 7836. Whilst good quality, these bracelets were prone to stretching quite quickly, resulting in a loose fit and gaps appearing between the links. Tudor incorporated the new solid-link Oyster bracelet ref. 78360, which is a much more robust improvement. 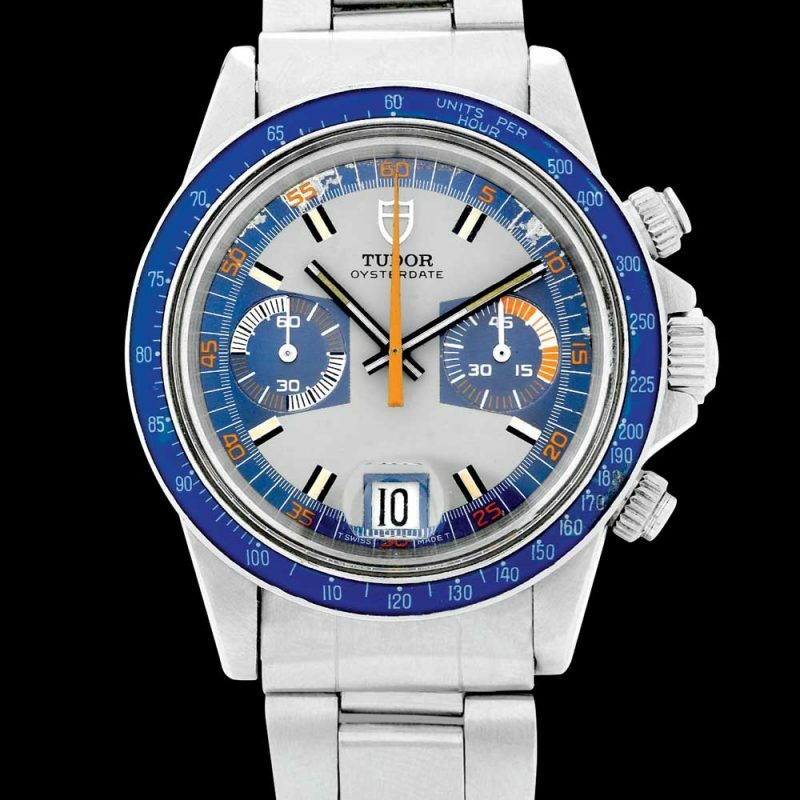 Due to the length of time that Tudor produced these watches, they are less rare then the Home Plate watches and so command less money on the collectors’ market. Home Plate watches are now reaching prices almost on a par with vintage manual-wind Daytonas for very nice examples. The Monte Carlos remain, however, collector favourites and they are more frequently appearing in important watch auctions. A case in point is the inclusion of a blue 7149 in the May 2017 Phillips Geneva sale. The watch sold for CHF 27,500 – almost three-times its low estimate. In 2010, Tudor launched, to critical acclaim, their Heritage range of watches – modern watches based heavily on key pieces from their archive. Their inspiration for the first release was the aforementioned reference 7033 prototype chronograph, with rotating graduated 12-hour bezel. The watch was available with both grey and black dials referencing both known dial versions from the 1970s. The watch faithfully recreated the key characteristics of the original Homeplate, but in a slightly larger case and with a sapphire crystal (sans date cyclops). The watch was a smash hit and the biggest news to come out of Baselworld that year. 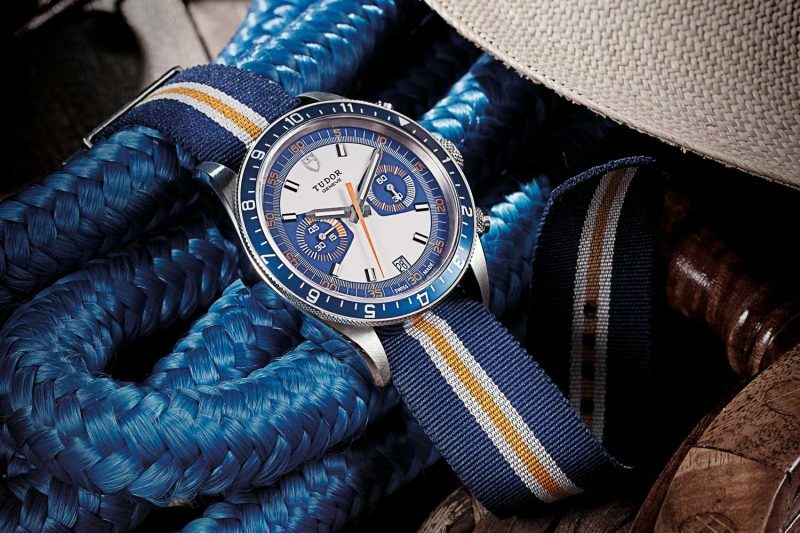 In 2013 Tudor followed with a second Heritage Chrono – the Blue. The second version was very heavily based on the 7169 Monte Carlo. Again, housed in the 42mm case with sapphire crystal, the watch was essentially the same the original Heritage Chrono but with a new bezel insert and dial. These watches have been incredibly popular with both buyers of modern watches and also vintage collectors who want the look of the old Tudors but in a modern day-to-day wearable timepiece.